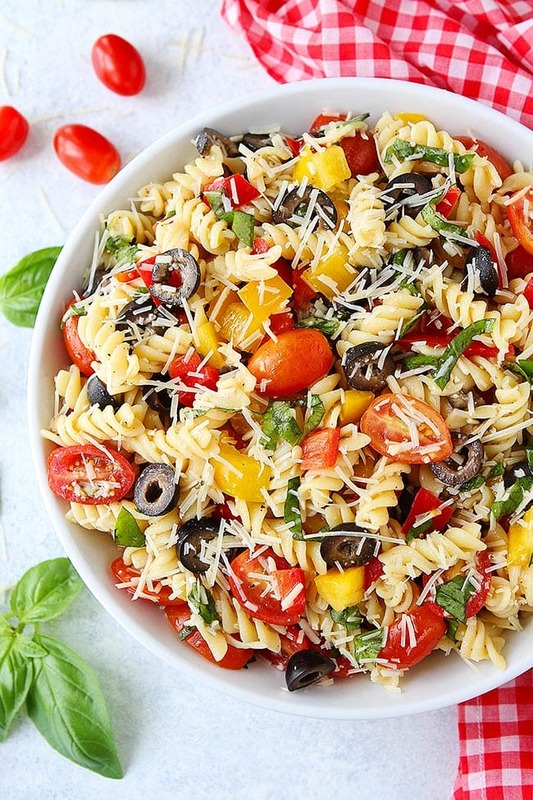 This Easy Pasta Salad is one of our favorite summer recipes. 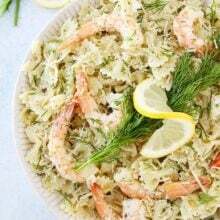 It is a great salad to serve at bbq’s, picnics, and pool parties. It is also great to have in the fridge for easy summer lunches and dinners. You can’t go wrong with this pasta salad recipe! During the hot summer months, we like to eat salads for lunch and dinner. Sometimes Josh gets tired of green salads, so I mix things up with pasta salads. Cold pasta salads are a summer lifesaver! This easy pasta salad is one of our favorites. I actually grew up on this pasta salad. This was a staple at our house every single summer. We would come in from playing outside or from swimming and eat this pasta salad. It is SO easy and that is why I love it…well, and the fact that it is delicious too! There is nothing fancy or fussy about this Easy Pasta Salad and that is a very good thing. We are all about easy during the hot summer months! This is a classic pasta salad that everyone loves! It is the BEST pasta salad! You can use any pasta, but I like to use fusilli, penne, or rotini. The shapes are fun and bite size, making them easy to eat for kids and adults. You can even use the tri-color rotini noodles, the kids always love those. When the pasta is done cooking, drain and rinse it well with cold water. Drain again to avoid soggy pasta. In a large bowl, combine the pasta with the other ingredients. For this recipe, I like to use bell pepper, tomatoes, and black olives. Pro tip, buy sliced black olives so you don’t have to cut them. A great time saving tip! Dress the salad with your favorite store bought Italian dressing. We like to use this one. See, I told you this salad was easy! Sometimes it is ok to cheat and use a store bought dressing. Summer is all about EASY! Finish the salad with fresh basil and freshly grated parmesan cheese – it really enhances the flavor. This salad is great served at room temperature or cold. It can be made in advance and will keep in the refrigerator for up to 3 days. Like I mentioned, this salad has bell peppers, tomatoes, black olives, basil, and Parmesan cheese, but feel free to mix things up. That is the beauty of a pasta salad, it is easy to mix things up. Use what you have on hand. We are all about cleaning out the fridge in the summer and using what we have in our garden or what we pick up at the farmers market. The options are endless! You really can throw in just about anything. Use your favorite ingredients and don’t be afraid to play around. 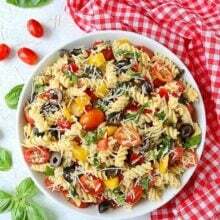 Make sure the pasta salad is well coated with dressing so the noodles don’t stick together and you want the pasta salad to have plenty of flavor. If you want to make a simple homemade olive oil herb dressing instead of using store bought dressing you certainly can! 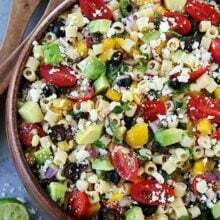 We will be serving this easy pasta salad at all of our summer parties and bbq’s. Plus, it is a great salad to have in the fridge for easy lunches and dinners. We hope you like this pasta salad recipe as much as we do! 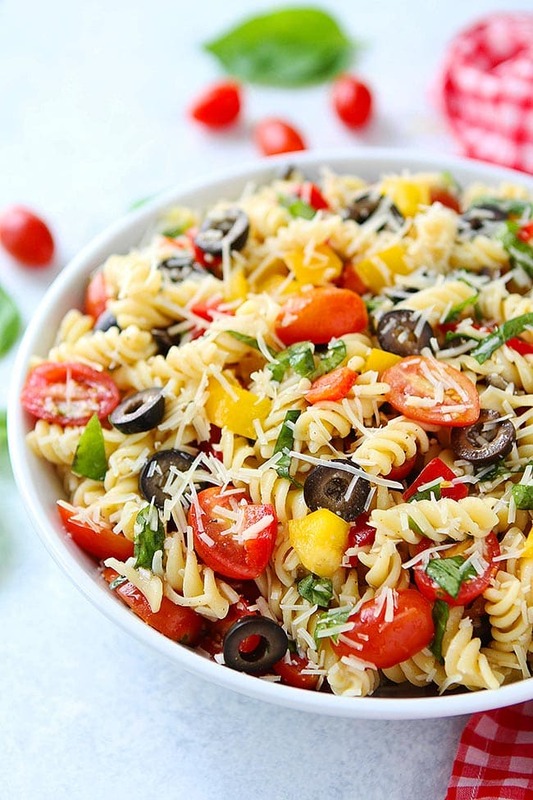 This easy pasta salad recipe is a summer favorite! Take it to a potluck, picnic, or enjoy it for lunch or dinner! In a large pot of salted boiling water, add the pasta. Cook according to package instructions. Drain and rinse the pasta with cold water. Drain the pasta well after rinsing. In a large bowl, combine the pasta, bell peppers, tomatoes, and olives. Add the dressing and stir until pasta noodles and vegetables are well coated. Stir in the basil and Parmesan cheese. Season with salt and black pepper, to taste. Serve at room temperature or cold. I’m a big fan of pasta salad. So many times they are loaded with dressing and oily tasting. This one looks light and summery! Perfect for a BBQ on a hot summer day. Looks great Maria! I love seeing new salad ideas as I definitely get sick of green salads too. Beautiful! Pasta salad is one of my all time faves–any time of year. I will kindly take all of this pasta salad off of your hands! Looks absolutely delicious! I made something similar not too long ago. Love pasta salads on hot nights! What a colorful and healthy salad. 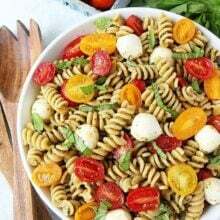 Rotini is such a great pasta for salads. I love all of the fresh ingredients in this! Perfect weeknight meal! We love Pasta and we love cold pasta salads ..mmmmm yummy! Sounds tasty and fresh. Anything with fresh basil is great. This looks so bright and fresh—I’m all about bright and fresh 🙂 …and if you made it, I know it’s a win! What a great photo & delicious recipe. We love pasta salad! I look forward to meeting you too! Make sure you say hello. It looks fresh and healthy! Oooh! Love this! Love pasta salads, and ones that are not cream based. 🙂 Stunning pic, as always! Too, too hot to cook and I’m scarfing up every salad recipe I can find. This one looks perfect! This would be perfect on a crazy summer night. Such wonderful veggies and the kids would love this! What lovely color. I too enjoy cold pasta salads for the summer. We always have one in the frig. waiting for us. This one may be next. Have a great day! Perfect for those nights when you really don’t feel like eating all that much. Great recipe! 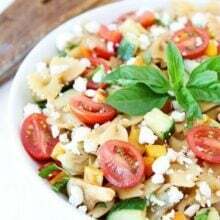 A healthy, light and flavourful pasta salad! I would love some for my lunch. Looks perfect for this weekend! A fresh vegetable salad and a perfect dressing sounds so nice on a summer evening. Thank you for the post. Can’t wait to see you next week. That looks really good. I will have to make this when my cucumber and bell peppers are ready in my garden. Very healthy and refreshing. I could eat this kind of salad all summer long. This looks like a perfect dinner for the crazy busy months of summer. Light, fresh, and fast! Mmm, looks like the perfect dish to bring to a potluck! 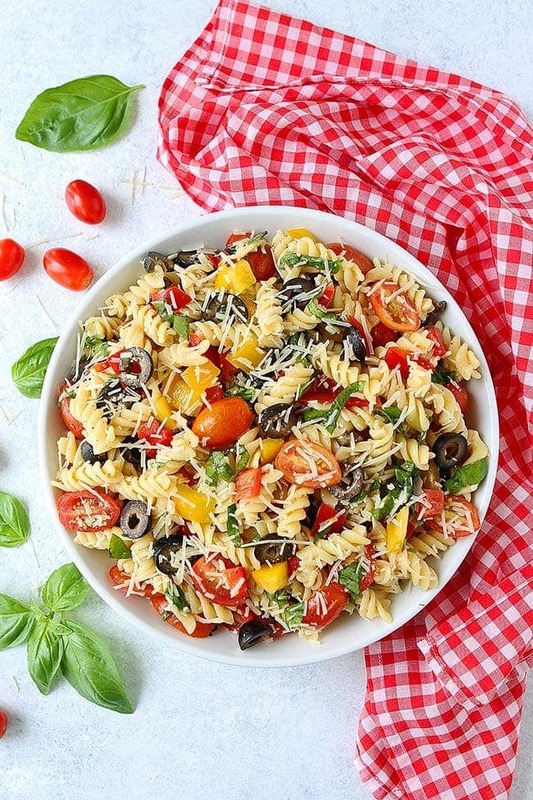 What a beautiful summer pasta salad – looks delicious! Yum! Gorgeous simple salad! Love it! Your pasta salad looks lovely. I have to admit that I get sick of green salads pretty quickly, but I know I’d love this – especially with lots of good veggies mixed in! I do enjoy cold salads during the summer, and pasta salads are a great way to add bulk to green salads. I like this simple take on it; lends well to lots of customization! Made this ahead of time for Memorial Day camping and was great! Thanks for the recipe! Love how this can be made in advance…perfect for summer entertaining and guests!